Hi, I have a Pro Force electric trolley and the left wheel retention mechanism has failed. 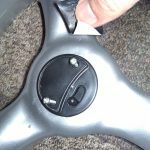 It has a sliding toggle that should be spring loaded but the spring appears to be broken and will no longer lock the wheel to the axle. 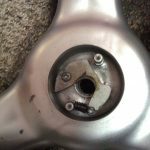 The wheel retention clip you sell appears to be different to the mechanism on the Pro Force, are they interchangeable? Hi Steve, I know exactly which mechanism you mean. Unfortunately we don’t have that one, only the spring clip on the store. These are not interchangeable, you may need to source a new wheel. If you find a solution please let me know and I can publish this with your permission. After taking it apart I found the spring had broken at one end. I was able reform the loop and reattach and it is working again. Probably not for long but gives me some time to find something more permanent.